This evening we were driving in the fog. It was dark and the fog was very thick. At one point (I was driving) I could barely see ahead of me. I had to slow down, focus intently on the road, and then…all I could do…was trust. I couldn’t see what was up ahead or what was coming at me. Only what was directly in front of me. I was thinking how sometimes in life, this is just what God does. 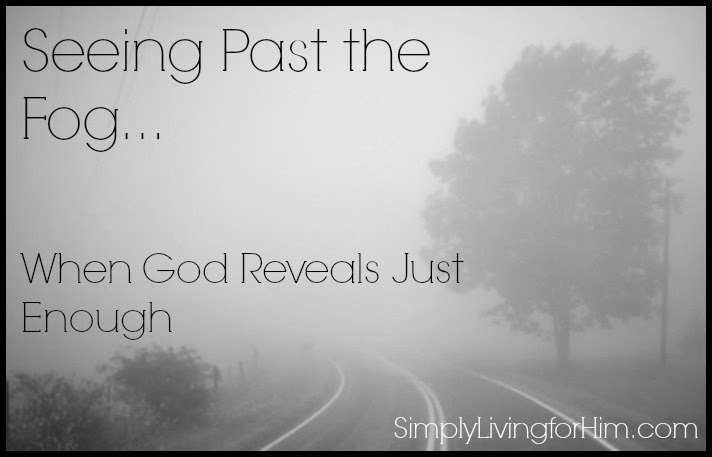 He takes us into a foggy place, and gives us just enough to see where we are at the moment, and with our eyes on the road, trusting. We can’t see what lies ahead of the fog…if a turn in the road is coming up, or a sharp curve. We can’t see if it is just a straight road ahead or a hill. We simply keep our eyes fixed on the road and trust. We have points in our life sometimes where we can really complicate things by trying to figure it all out before it is time for us to know. We want to know what lies ahead, and know what is in store for us. Yet, God doesn’t always reveal that to us. Sometimes He just gives us right now. I have chosen lately to trust the foggy places. To be content with the here and now, and not always try to figure it out, because the beautiful thing is…He knows what lies ahead…every curve, every sharp turn, every hill, and every valley. He’s already there. Oh, is that comforting. It is comforting to give it all to Him, and not try and figure out the details. I can just rest knowing that if I focus on Him and focus on the path He has put me on, He will bring me out of the fog safely. We complicate life so much by trying to know the future. Our job is always to seek Him first, and let Him provide the rest. Sure we can plan, but ultimately His plans prevail.